But many people hear the last line as “’Scuse me while I kiss this guy”, and that misperception actually reveals something very interesting about how English consonants work. What makes /k/ different from /g/? Both /k/ and /g/ are what linguists refer to as “stops”, they’re consonants where the airstream out of the mouth is completely obstructed, and actually, both /k/ and /g/ are “velar” stops, made with the tongue up against the soft palate, or velum. Try it, making a /k/ as in “cap” and a /g/ as in “gap”, one after the other, and you’ll notice that your tongue isn’t changing position when you switch from /k/ to /g/ at all. 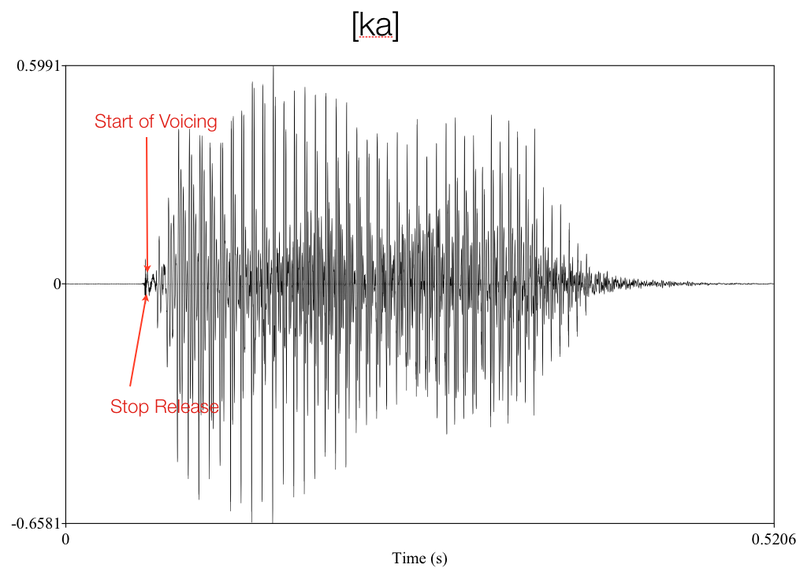 The simplistic explanation is that /k/ is a voiceless sound (meaning that our vocal folds/cords aren’t vibrating while we make the closure), and /g/ is a voiced sound, involving glottal vibration during the closure. Unfortunately, like most things in phonetics, it’s not quite that simple or easy. Then what you have is [k], what linguists refer to as a “voiceless unaspirated stop”, with a voice onset time of 0 (or close to it). So, we have three stop choices: Voiced stops, voiceless unaspirated stops, and voiceless aspirated stops, which are all used differently in the different languages of the world. But how does this affect Jimi Hendrix? Our problems with Jimi Hendrix kissing guys (not that there’s anything wrong with that) come from three fundamental oddities in the way that English produces stops. First, English only distinguishes between Aspirated and Voiced stops. “cap” starts with a /k/, which is produced with aspiration, and “gap” starts with /g/. We don’t have a three way contrast between voiced [g], voiceless unaspirated [k], and voiceless aspirated [kʰ]. Korean, as I’ve mentioned before, has that three way contrast. 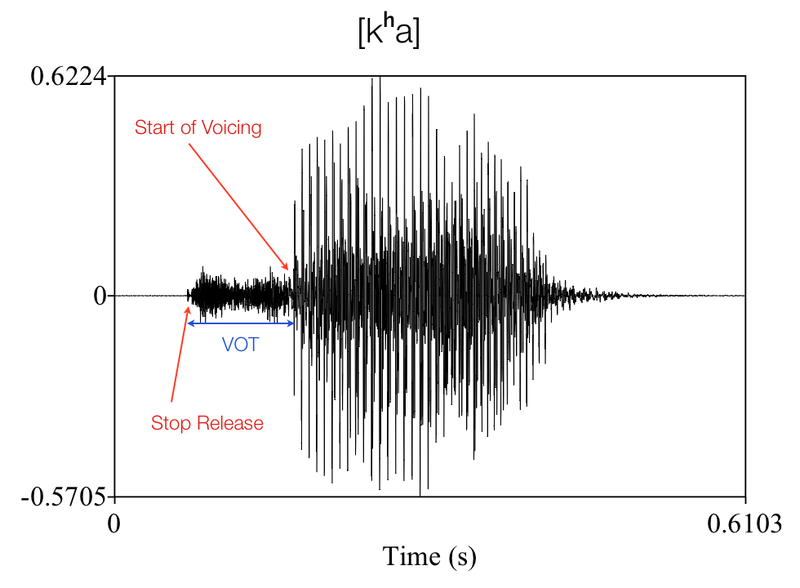 Second, English word-initial (at the start of a word) voiced stops are actually produced as voiceless-unaspirated stops, with a VOT of ~0. 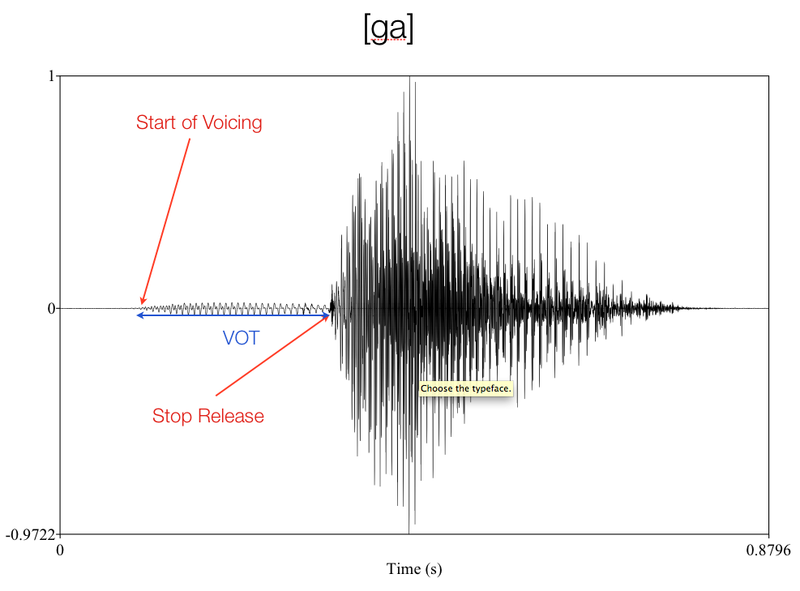 This is because we, as English speakers, have really strong aspiration in our voiceless stops, so even if we produce something without much voicing during the closure, listeners will still be able to understand that it’s not aspirated, so clearly, the speaker must be intending to express voicing. 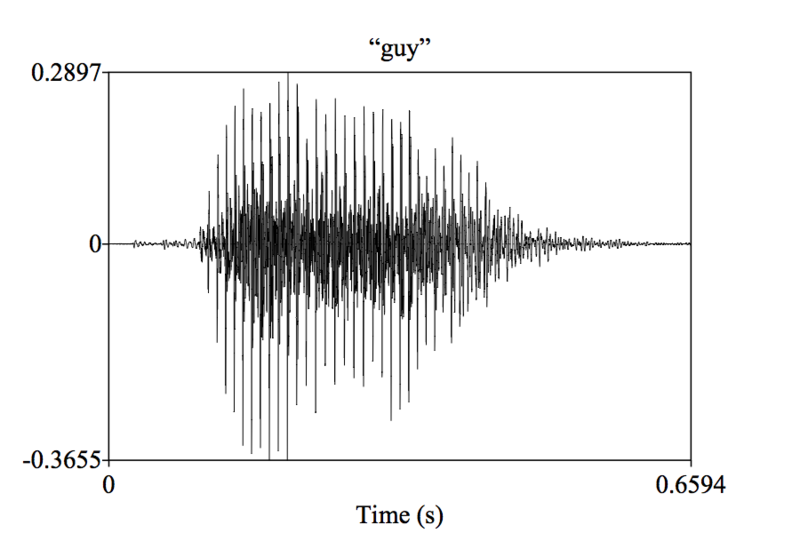 Here’s a waveform of the word “guy”, to prove the point. Note that there’s a very little VOT here. 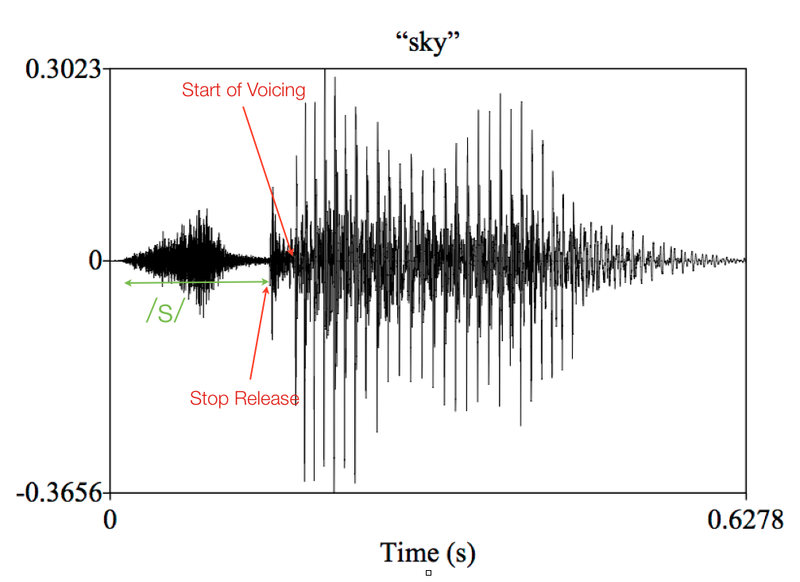 So, in effect, the /g/ in “guy” and the /k/ in “sky” are the same sound! Still don’t believe me? Well, first listen to sky, then listen to guy, then listen to “sky” where I’ve digitally removed the /s/. Your writing system has been lying to you! So what does Jimi Hendrix kissing men have to do with Stop Acoustics? … is seen to be only a question of where you put the /s/, and thus, really, no difference at all. So, we see that not only are sounds in English not what our writing systems makes them out to be, but that this “error” of perception is not only understandable, but linguistically fascinating as well. So, next time you find yourself listening to Purple Haze, Thank Jimi Hendrix for providing one of the best examples of the perceptual troubles which can come from our lack of a voiced/voiceless-unaspirated contrast in the English language. Or, curse me for linguistically corrupting an otherwise good song. Either or, really.